Familiarize-se com as vistas espectaculares de Sevilha num passeio privado a cavalo e carruagem e a pé. Depois de subir a bordo de uma confortável carruagem, você visitará pontos turísticos importantes, como a Plaza de España, a Torre de Ouro e a Catedral de Santa Maria de la Sede, tombada pela UNESCO, durante uma viagem de 1 hora. Em seguida, personalize o seu passeio a pé de acordo com os seus interesses e receba toda a atenção do seu guia privado enquanto explora a tapeçaria cultural de Sevilha. The temperatures in Seville were going to get to 105 degrees today, so we welcomed starting our tour at 9:00 AM. Our horse, carriage and guide awaited us at the hotel. We had a nice hour-long carriage ride through the parks around the area of the 1932 Spanish Exposition. Our guide was knowledgable and sufficiently explained what we were seeing. My wife had two knee replacements in the last year and opted out of the walking portion of the tour. Having the flexibility of a private guide allowed her to travel back to the hotel by cab while my granddaughters and I went on to other attractions. We saw many of Seville's highlights and learned much of its history. 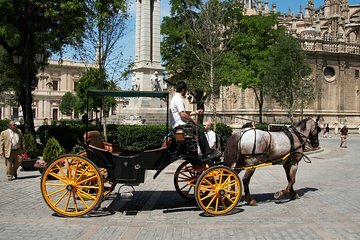 For those seeking a relaxing half day highlights tour of Seville I would recommend this trip.